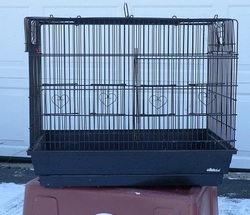 I have 2 of these black Hoei cages suitable for any small birds. One is in very good condition; one has damage to the clips that attach the top to the base. 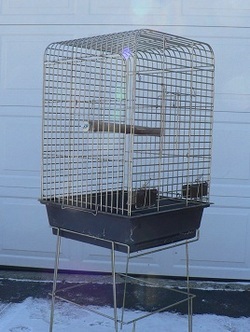 This is a beautiful and very sturdy cage with stiff metal bars. It could be used for birds or rodents. 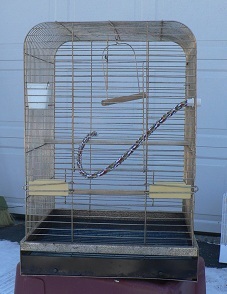 This is a cage suitable for small to medium parrots. 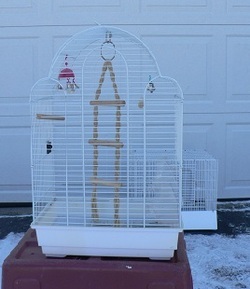 It has 1" bar spacing so probably not good for cockatiels. It is in excellent condition and comes with a stand. 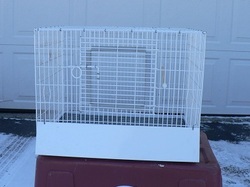 It has a heavy duty perch at this time because it was a sleeping cage for a cockatoo but can be refitted with smaller perches.